In what is seen as unprecedented, the Gandhi family faces a challenge in its long held political bastion with BJP’s prime ministerial nominee Narendra Modi storming Amethi on Monday. Hours before Modi landed in an open field in Dulapur village, some 5 km off Amethi’s district headquarter in Gauriganj, thousands of his fans began to converge from different directions, including the neighbouring districts of Rae Bareli, Pratapgarh and Gonda. The crowds included many youngsters who seemed awestruck by Modi’s persona in a constituency where the electorate took pride in its association with India’s first political family for nearly four long decades. Narendra Modi’s hour-long speech, spiced with humour and sarcasm against the Gandhis, left the crowd in splits. Sure enough, a challenge for the Gandhis in their pocket-burrow was something no one had ever imagined. 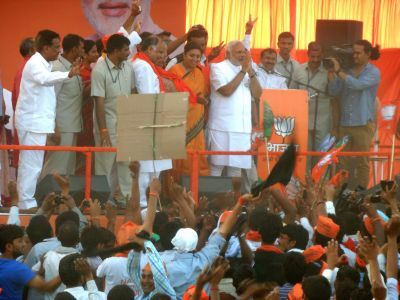 Modi, whose original campaign itinerary did not include Amethi, was understood to have decided on addressing a rally in Amethi as late as April 30 after BJP’s late entrant Smriti Irani managed to impress upon the party’s campaign committee that she was well in the race. Before that, even BJP top guns, including Modi’s close lieutenant Amit Shah, were ready to concede that Amethi was among the very few seats the Congress would be able to retain in UP this time. BJP bigwigs realised that when a political nonentity like Ajay Agrawal could attract a visibly high percentage of votes against Congress president Sonia Gandhi in neighbouring Rae Bareli constituency, where polling was held on April 30, then why should the party give up on Amethi. In fact, Aam Aadmi Party leader Kumar Vishwas, who was the first to jump into the Amethi fray more than two months back, had already paved the ground for raising several questions against Rahul Gandhi and his alleged “political tourism” in Amethi. Smriti Irani has been doing her best to capitalise on the dent made by Kumar Vishwas. That the Amethi plan was an afterthought was also demonstrated in the absence of BJP chief Rajnath Singh and Amit Shah from this rally. Other than UP BJP president Kaxmi Kant Bajpai, no prominent BJP leader from the state was around. Modi, who was already quite worked up over the Congress leadership’s repeated talk about investigating the snooping case, readily agreed to take on the Gandhi scion on his own home turf. And when it came to that, he left no stone unturned to make frontal attacks on the mother-son duo. Referring to his “dil maange more” remark, for which Sonia sought to ridicule him by saying, ‘Modi is always asking for something’, Modi remarked, “I am not ashamed to ask; at least that is better than looting.” In the same vein, he went on to ask, “aap ko maangne wala pasand hai ki lootne waala”. The massive crowd responded with “maange wala” in chorus. Modi chose to stick to his development theme, while repeatedly emphasising on how Amethi had remained neglected under successive Gandhis. While Smriti Irani had already raised the pitch on the “pathetic” development in Amethi, Modi sought to assure the crowds that once his government was in place, he would ensure transformation of Amethi. “Once my government is formed, I can assure you that Amethi’s development will remain on top of my agenda and I will ensure its transformation in just 7 months,” he told the crowd amidst cheers. “That is only a lame excuse to cover the family’s own failings and apathy. Let me tell you that if I am sitting at the centre, there is no reason why a Samajwadi Party government sitting in Lucknow would refuse my request for providing potable water or pothole-free roads, better irrigation or improved power supply to the people of Amethi,” he said. Modi, who had earlier during the day, addressed three other rallies in other parts of Eastern UP, including one in Faizabad (the twin city of Ayodhya), did not allow any shift of focus from Amethi’s development. And each time he drew the attention of the surging crowds to the “neglect” of Amethi, or to the failings of Rahul Gandhi, pat came a resounding affirmation with cries of Modi-Modi from the delirious audience – something never witnessed before in Amethi. He hailed the people of Amethi to have mustered up courage to raise questions before the Gandhi clan. “The family has been seeking your vote only through their emotional blackmail in all these years. I salute you all to have at last raised your heads to demand what is legitimately yours and has been denied to you,” he said amidst loud cheers.